The title of this post is slightly misleading. In truth, it does contains advice from Eric Arthur Blair (1903-1950) whose pen name was George Orwell. However, because of the impact of his two dystopian classics, Nineteen Eighty-Four and Animal Farm, the author’s name has actually become a true English adjective . . . one that might suggest I’m alluding to futuristic or totalitarian matters. Despite the enormous (and eternal) differences between Orwell and Lewis, they did have something significant in common. More about that in a moment. Much is made of the fact that the scientists are actually in touch with evil spirits, although this fact is known only to the inmost circle. Mr. Lewis appears to believe in the existence of such spirits, and of benevolent ones as well. He is entitled to his beliefs, but they weaken his story . . .
Orwell was one of those “professing” Christians who is accurately labeled a hypocrite. He was a communing member of the Church of England, and advocated a Judeo-Christian moral code, but did not believe in an afterlife. The following letter, written to Eleanor Jaques in 1932, reveals his hypocrisy. It seems rather mean to go to HC [Holy Communion] when one doesn’t believe, but I have passed myself off for pious & there is nothing for it but to keep up with the deception. In a comment to my last post, a good friend of Mere Inkling, Brenton Dickieson at A Pilgrim in Narnia, reminded me of a thought-provoking essay on English written by Orwell. His essay, “Politics and the English Language,” addresses a number of problems with the language. He considers dying metaphors, verbal false limbs, pretentious diction, and meaningless words. What is above all needed is to let the meaning choose the word, and not the other way around. In prose, the worst thing one can do with words is surrender to them. When you think of a concrete object, you think wordlessly, and then, if you want to describe the thing you have been visualizing you probably hunt about until you find the exact words that seem to fit it. When you think of something abstract you are more inclined to use words from the start, and unless you make a conscious effort to prevent it, the existing dialect will come rushing in and do the job for you, at the expense of blurring or even changing your meaning. Probably it is better to put off using words as long as possible and get one’s meaning as clear as one can through pictures and sensations. Afterward one can choose—not simply accept—the phrases that will best cover the meaning, and then switch round and decide what impressions one’s words are likely to make on another person. Students of Lewis will note in the final passage the parallel with advice he provided to a correspondent in 1956. Although the context is different—Orwell’s is a formal essay and Lewis’ a casual correspondence written to a child, the similarities are significant. Lewis would have been familiar with Orwell’s essay, composed a decade before his letter, but the resemblance between their words is better attributed to shared literary philosophies and the self-evident nature of the principles. Lewis identified five important considerations when writing. 1. Always try to use language so as to make quite clear what you mean and make sure [your] sentence couldn’t mean anything else. 2. Always prefer the plain, direct word to the long, vague one. Don’t implement promises, but keep them. 5. Don’t use words too big for the subject. Don’t say “infinitely” when you mean “very;” otherwise you’ll have no word left when you want to talk about something really infinite. If you are interested in reading Orwell’s “Politics and the English Language” in its entirety, you can find it here. I’ve not read anything by Orwell, but I am familiar with the advice Lewis offered. Great post and cartoon. 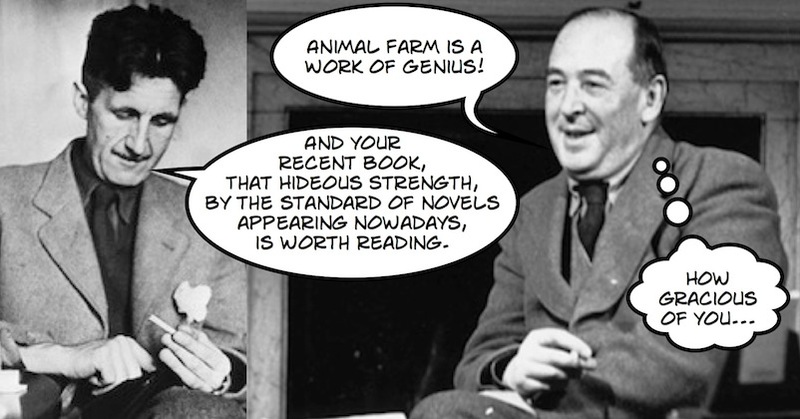 A great post on Orwell and Lewis on Writing by the Mere Inkling! I’ve been thinking of Animal farm and 1984 recently and have been surprised how many people toss out phrases from those books in conversations. I knew the two authors snarked at each other. (Lewis was studied much less at that time – state university). Rediscovered Lewis a few years ago as my daughter had Narnia title as an assignment. How delightful to read their “writer’s guides” – those are treasures. One must hope – modern society is discouraging….need more reading and writing and thinking….these two writers would be a good place to start? Enjoyed reading your link. Thanks.